Ah, Bell’s Brewery. One of the first Midwest breweries I visited after getting into the craft beer scene. Because of this they will always hold a special place in my heart and give me reason to seek out their stuff when I’m back in Ohio. And that is precisely where I got today’s beer from. 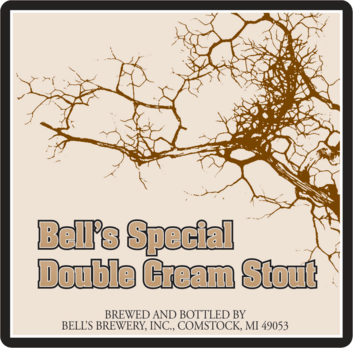 BELL’S SPECIAL DOUBLE CREAM STOUT is an American Stout with a 6.1% ABV. Special Double Cream Stout derives its name from its smooth, creamy texture, not the ingredients. Completely dairy-free, this stout blends ten different specialty malts to yield a remarkable depth of flavor. With only a touch of burnt notes, Special Double Cream Stout focuses on the softer, cocoa & espresso-like aspects of roasted malt. The beer poured a deep brown color with a ring of oatmeal-colored foam. No light penetration or lacing was noted, but there was a surprising amount of bubbles for a stout. Chocolate, malted milk, and Hershey’s syrup dominated the aroma of this beer. In all honesty it smelled more like something you’d get at an ice cream parlor than a tavern. Some mild coffee and roasty notes keep it from being completely one-dimensional. And yet the beer wasn’t a complete sweetness bomb. Dark chocolate and roasted malts kick things off in the flavor portion of the drinking experience. The malt combination gives it a sweet espresso ice cream-like creaminess that appears throughout the middle of the drink. Slight touches of molasses and alcohol close things out. If I didn’t know better (which I didn’t at the time) I would have sworn that there was actual lactose in this beer, but according to the brewery this beer is lactose/cream free. Huh. Mouthfeel is medium and full of those bubbles that I spoke of above. However, it was not nearly as creamy as you would expect from a beer called “Double Cream Stout”. Mild residual stickiness is left behind after each sip. Although the flavors in this stout were solid, I kinda hoped for a little more creaminess in this Cream Stout. And the burnt/roastiness level was probably a smidge higher than everyone would have wanted (they claim they were going for low levels). These expectations probably hindered my drinking experience a bit, but that doesn’t mean I didn’t enjoy each sip. If I get the chance to have this beer again I hope it’s when it’s poured over a bowl of ice cream.